Many people who move to the city from the countryside notice that their skin loses some of its former beauty. And science backs this up: pollution makes the skin age prematurely, destroys its hydrolipid film and impairs cell renewal. Zeropollution® has been developed to counter these processes - which are only likely to get worse in the years to come … This product can be applied to the skin or taken orally. Who is Zeropollution® aimed at? Those who live close to a busy trunk road or in an area with heavy traffic. Those who live in a large town or close to commercial or industrial zones (conditions which potentially increase the incidence of coughs, rashes, itching and eye irritation). Those who live in sunny locations. Those who feel they’re ageing quickly. Those who are stressed and are not getting quality sleep. Those who exercise outdoors in urban settings. Those suffering from dermatological problems. “They did not all die, but all were stricken”, recounts Jean de la Fontaine in The animals stricken with the plague. 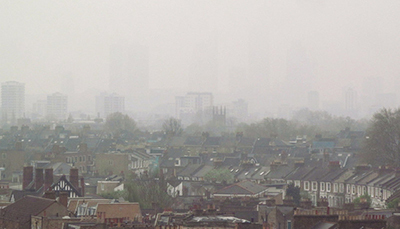 This is in some ways similar to what happens with pollution: in 2002, the WHO estimated that around 1.4% of all premature deaths in the world were due to air pollution in urban environments, though they did not provide statistics on the effects of this same pollution in aggravating diseases or encouraging the development of skin problems (premature ageing, allergies, hypersensitivity ...). As human activity continues to intensify across the planet (industry, heating, transport), pollution is likely to get even worse. The skin is the body’s main organ in direct contact with the external environment . In vitro and in vivo studies have shown that pollutants adversely affect skin quality and underlying cell mechanisms. Skin problems such as eczema, acne, allergies and psoriasis have been rising steadily in industrialised countries. 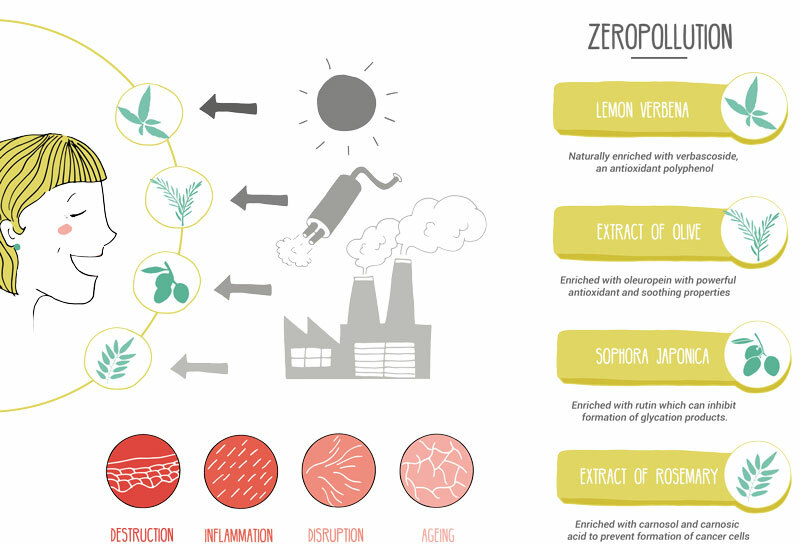 What are the ingredients in Zeropollution® and how are they of benefit? 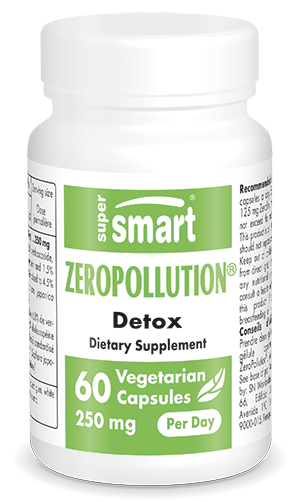 Zeropollution® is 100% natural and contains four plant extracts carefully selected for their antioxidant potency and ability to protect against pollution. They are all enriched with active principles to ensure maximum efficacy. Sophora japonica is a large tree indigenous to China, listed in the European pharmacopoeia. Its flower buds contain rutin and quercetin, two flavonoids recognised for their antioxidant activity and effects on cell permeability. A number of studies have shown that photo-ageing decreases when antioxidants such as quercetin are applied to the skin. It may increase production of glutathione and activity of superoxide dismutase, two endogenous antioxidants, as well as inhibit the formation of glycation products in the skin’s collagen. In vitro and animal studies show that rosemary can inhibit the formation and proliferation of cancer cells (1-3). Of considerable interest to dermatologists, these effects may be due to two polyphenol compounds in rosemary, carnosol and carnosic acid (5). Verbena leaves are recognised for their soothing and antioxidant properties. The extract in Zeropollution® has been enriched with verbascoside, a remarkable antioxidant polyphenol which also helps reduce inflammation. Olive is an excellent source of vitamin E, which is recognised for its protective role against free radicals and oxidative stress. This extract is enriched with oleuropein, a phenolic compound with powerful antioxidant properties and which is responsible for the bitter taste of extra-virgin olive oil. To increase resistance to pollution-induced oxidative stress. To help reduce inflammation of the skin. To protect the skin from UV radiation. To inhibit the over-activation of AhR (aryl hydrocarbon receptor) induced by pollution. What are the real effects of pollution on the health of the skin? There’s increasing scientific understanding of the physiological mechanisms behind the links between skin health and air pollution (6-7). When the skin comes into contact with pollutants, a cascade of reactions occurs which ultimately leads to the release of toxic compounds called free radicals. Toxins such as pollutants are able to activate a specific compound in skin cells calledAhR (aryl hydrocarbon receptor). This is normally trapped by a complex of proteins and therefore has no effect on cell structures. But when activated by pollutants, it releases itself from this complex, migrates to the nucleus and triggers the expression of genes involved in the production of free radicals, hyperpigmentation, inflammation and immune-suppression (8). It is also able to interact with the sun’s UVB rays, causing even greater damage. disruption to skin tissues due to a decrease in calcium concentrations. What are the principal sources of pollution? Tobacco smoke. Cigarette smoke is absorbed by the skin and mucous membranes (9). It causes irreversible changes that make the skin look grey and lined. It also leads to a decrease in microcirculation in the skin (10) as well as delayed wound-healing. This applies not only to smoke which is breathed in but also to smoke that persists in the atmosphere, and though less well-known, to that which accumulates on surfaces. Fine particulate matter from traffic. This is undoubtedly the source of pollution which is of most concern to dermatologists. Some of these fine particles are smaller in diameter than the skin’s pores and are able to penetrate the skin, causing inflammation, dehydration, loss of firmness, degradation of support tissues and disruption. Solar radiation. The sun acts in complete synergy with atmospheric pollution. The two principal solar rays aggravate the three processes associated with ageing: free radical production, peroxidation of lipids in cell membranes, and glycation. Characteristics Deeply absorbed as far as dermis fibroblasts. Absorbed at the surface by epidermal cells as far as the basal layer. Blue light emitted by screens may also have an effect on photo-ageing as it has the highest energy rays of all. They may increase levels of free radicals and promote the formation of pigmented spots. Polycyclic aromatic hydrocarbons (PAHs). The burning of organic matter and car exhaust fumes are polycyclic aromatic hydrocarbons . They can be absorbed by the epidermis and induce production of chemicals (epoxides, diols) toxic to DNA. Ozone. Largely man-made in origin, ozone is a pro-oxidant that can alter skin integrity by inducing oxidative stress in the outer layer of the epidermis. This generally causes inflammation, an imbalance in the epidermis plus a breakdown of collagen and elastin fibres, creating the right conditions for skin ageing. What additional measures can be combined with taking Zeropollution®? Zeropollution® is an innovative dietary supplement, completely natural and free of side-effects. It offers a solution to a major problem which affects the whole world and will only get worse in the years to come. Consume more antioxidants. Exogenous antioxidants unquestionably help fight oxidative stress caused by pollution. Antioxidants are found in fruits and vegetables, especially brightly-coloured ones (blueberries, raspberries, broccoli, red cabbage, yellow peppers, red beans, etc), as well as in antioxidant formulations such as AntiOxidant Synergy and OptiBerry. Drink enough fluid. You should drink at least two litres of water and other fluids every day in order to maintain the health of your skin. Ensuring a good level of humidity in your home (50% in the summer, 30% in the winter) is also a good idea. Moisturise your skin and consider having a massage. As well as making wrinkles less obvious, moisturisers maintain and support the skin. Massage can help restore natural hydration and release toxins from the skin. Exercise. Physical activity is recognised for promoting microcirculation which is key to maintaining healthy skin. Boost your immune system. A healthy immune system helps make the skin less vulnerable to the dangers of pollution. Make sure you have an adequate intake of vitamins C, D, E, B6, zinc, selenium, iron and copper. A lack of one of these micronutrients is enough to significantly reduce the skin’s immune defences. RDA not defined. ZeroPollution®, Monteloeder, Spain.